Wet Keep It Clean Foaming Toy Wash Keep Your Toys Fresh and Clean With This Gentle Anti-Bacterial Foaming Toy Wash. A Little Bit Goes A Long Way And It Stays Where You Put It. Will Not Harm Most Toys. Materials Including: Rubber, Silicone, Latex, Realistic Materials, Jelly Rubber, Plastic, Metal or Glass. 7.5 fl oz bottle of toy cleaner by Wet brand. Now Triclosan Free! 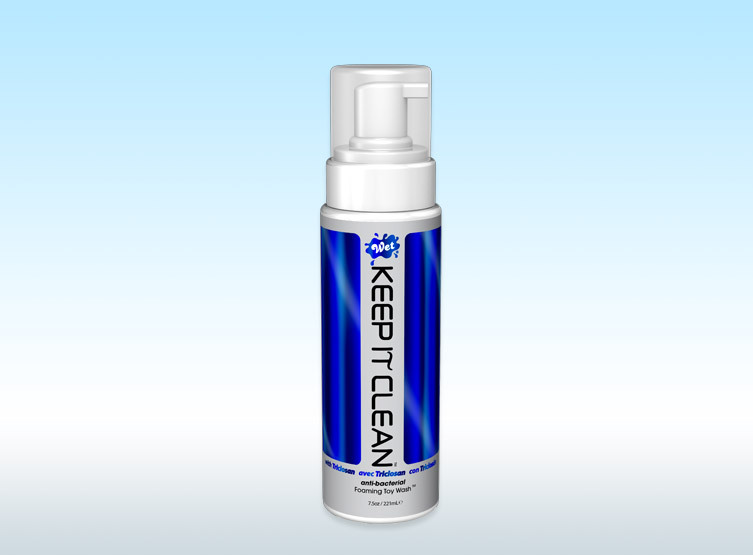 Gental Cleaner, Non-Irritating to the skin, Non Greasy, Alcohol Free, Derived from Natural, Renewable Sources. Ingredients: Deionized Water, Lauryldimoniumhydroxypropyl Decylglucosides Chloride, PEG-8, Polysorbate 20, Stearyldimoniumhydroxypropyl Laurylglucosides Chloride, Phenoxythethanol, Caprylyl Glycol, Hydroxyethylcellulose, Citric Acid, Fragrance.